Kerr Pump & Supply is your source for industrial and commercial tanks – water, ASME code steel tanks, plastic storage tanks and plastic tanks. Our tanks are well suited for the industrial, commercial, and agricultural markets. 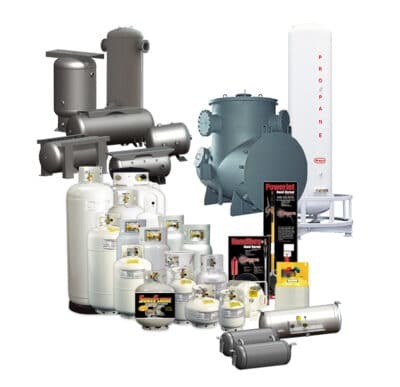 We can provide our tanks with various connections to meet your needs. We also offer fabricated tanks as well. We offer a full line of industrial and commercial tanks that meet ASTM D1998-06 standards. Some of our most popular styles are vertical tanks, horizontal tanks, water tanks, cone bottom tanks, double wall tanks, heat traced tanks and insulated tanks. For many years Kerr Pump & Supply has provided innovative tank mixing solutions for both domestic and international markets. Using our knowledge of mixing technology and expert in-house engineering, we design and manufacture cost-effective agitator systems that outperform our competitors. We can provide mixing solutions from Hayward-Gordon, Sharpe and ProQuip Mixers for a variety of applications and markets. Not familiar with these terms? Here is a quick reference. For further assistance, please contact Kerr using the form on the right, or give us a call. Top Entry Mixers – material goes in from the top and is used to mix varying degrees of viscosity. It can also be mounted through various options. 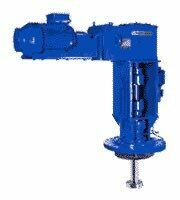 Mag Drive Mixers – contains an outer and inner magnet where the outer one provides power to a gearbox and the inner magnet and provides power from outer magnet to the shaft. Also has a shroud that blocks contaminates from drive components. 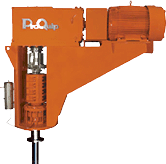 Dynamic In-Line Mixers – powered by an electrical motor and contains one or more mixing elements that perform a rotary motion about the axis of the flow path. Static Mixers – not powered and has no moving parts. It just alters the flow pattern of the product by placing baffles in its path. Portable Mixers – allow you to use the mixer on different tanks and applications for varying flow patterns and dead spots. Simfloc Sludge/Polymer Mixer – innovative engineered inline mixing system that provides a simple and cost effective approach to improve sludge handling operations by promoting greater contact between the sludge and polymer. It increases solid cake concentration, reduces hauling charges and improves centrate quality. Liquid Blending – the process of mixing of bulk solids with a small quantity of liquid. Solids Suspension – small solid particles that remain suspension in water as a colloid or from the motion of the water. Good for testing of water quality. Dispersion – a system in which particles are dispersed in a continuous phase of a different composition. It is classified by numerous ways, including how large the particles are in relation to the particles of the continuous phase, whether or not precipitation occurs, and the presence of Brownian motion. Dissolution – process by which a substance forms a solution in a solvent. The outcome of the process of dissolution is dictated by the thermodynamic energies involved. Emulsification – mixture of two or more liquids that are normally unblendable. In an emulsion, one liquid is dispersed in the other liquid. Usually used to manufacture polymer dispersions. Many process advantages include prevention of coagulation of product. Washing or Leaching – process of extracting a substance from a solid material that has come into contact with a liquid. The liquid is vital in leaching because it facilitates the ability to remove a substance from a solid material. Gas Dispersion and Absorption – for mass transfer. The agitator can affect the kla which will ultimately influence the mass transfer rate in the process. 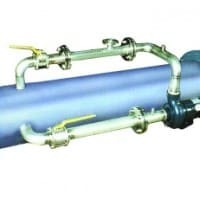 Gas absorption or scrubbing is an operation in which a gas mixture is contacted with a liquid for the purpose of preferentially dissolving one or more components of the gas mixture and to provide a solution of them in the liquid. Crystallization – chemical solid-liquid separation technique, in which mass transfer of a solute from the liquid solution to a pure solid crystalline phase occurs. Heat Transfer – heat is transferred by conduction from the wall of the vessel or surface of the internal heating elements to the contents of the vessel. Mixing helps aid in this by speeding up conduction from heat transfer surfaces, and helps promote heat transfer by forced convection. Heat transfer is similar to blending. Hayward Gordon/Sharpe/ProQuip for top entry mixers, static mixtures, mag drive mixers and dynamic in-line mixers. Amtrol/Wheatley/Wessels for Hydronic Specialties, Expansion Tanks, Custom ASME Tanks. Dynamix for Agitators Tote & Tank Mixers.